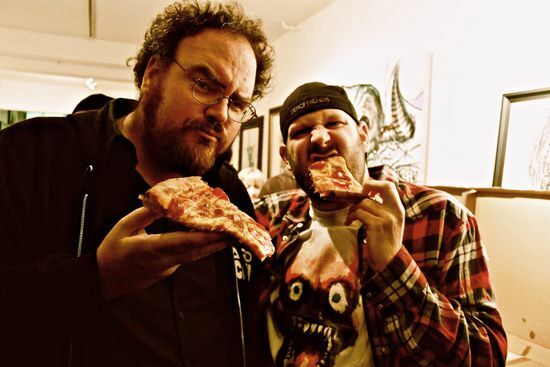 ALEX PARDEE'S LAND OF CONFUSION: MOVIE KNIGHTS RETURNS WITH JON SCHNEPP!! MOVIE KNIGHTS RETURNS WITH JON SCHNEPP!! One of my good friends and fellow artists is about to give YOU THE BUSINESS! Yes, that's right, I mean, how could we have Jon host without having some kind of "OCALYPSE" in the theme, right?? So yes, come down, eat some free pizza, meet Jon, watch some apocalyptic trailers, and THEN WATCH ONE OF THE MOST FUN, SCREAM-AT-THE-SCREEN APOCALYPTIC FILMS EVER! Neil Marshall's "DOOMSDAY"! Jon and I Eating FREE PIZZA FROM THE PAST! Alex Pardee x OCC LTD COFFEE For Charity! FINAL HOLIDAY SALE!!!! New Shirts, New MONSTER! NASA + PURELL = ZEROFRIENDS?? ICE WIZARD = BEST CHRISTMAS PRESENT EVER!